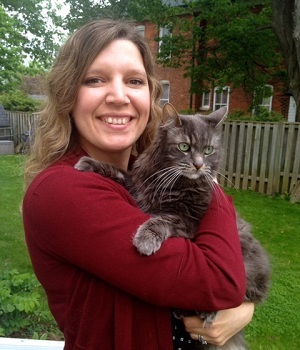 Dr. Ginger Louws graduated from the Ontario Veterinary College in 2007 after first obtaining her B.A. Honours in Music from the Ottawa University in 2002. She gained invaluable experience working in an Avian/Exotics clinic in Toronto for 5 years, after which she worked in Emergency clinics, Spay/Neuter clinics and other general practices in the GTA and Niagara Region. Dr. Ginger’s first passion is working with birds and she thoroughly enjoys helping rabbits, small mammals and most anything with scales! She has pursued additional training in veterinary dentistry and has special interest in soft tissue surgery and emergency medicine. When she is not working, Dr. Ginger enjoys pursuing her love of singing – as a choir member in the Georgetown Bach Chorale and in performing solo concerts in classical music. No stranger to the outdoors, she enjoys back country camping and white water canoeing with her husband Matt as well as road cycling. In quieter times, she curls up with a good movie, a knitting project and her two cats Drift and Mabel, with her 3 budgies singing non-stop in the background!